I sat curled up with my book, in a window seat that stretched almost the entire width of the room. My shoulder was pressed against the glass and seven stories below I could see the busy nightlife of Tokyo. Above me books hung from the ceiling like stars, forming part of the décor. The Book and Bed Tokyo hostel was everything I’d imagined and more. I was lucky enough to stay at this book haven last summer while on my exchange year in Japan. As a combined Japanese and publishing student at Oxford Brookes I spent my third year studying at the University of Tsukuba. I made the most of my weekends and holidays, travelling from the top most island, Hokkaido to Okinawa. I even made it over to China, South Korea and Thailand. I got to see and experience so many amazing things but through it all The Book and Bed Tokyo stayed at the top of my ‘To Visit’ list. I heard about The Book and Bed Tokyo in my first year of university. I was drawn to this hostel’s main attraction, the opportunity to sleep in a bookshelf! Set out like bunk beds there were ladders built into the shelves and readers could climb into their sleeping cubbies nestled behind the books. I had never before been so completely surrounded by books. At first I was so awed by my surroundings that my eyes would occasionally wander from the page, drawn upwards to admire the unreachable covers of the suspended titles. In keeping with this bookish theme, notices were boldly printed on top of ripped out pages, which might’ve seemed sacrilegious if it weren’t so aesthetically pleasing. Contributing to the peaceful atmosphere was soft music, which covered the hushed murmurings of fellow readers. The gentle lighting created a cosy ambiance and allowed people to read deep into the night. For me reading always seemed like a solitary activity. But as others sprawled nearby, getting lost in their own books, I felt a subtle sense of unity. There was a quiet hum of excitement we all shared, eager to be here in this book lover’s paradise. There was a range of Japanese and even English titles for customers to choose from, offering a chance for readers to be adventurous and try a new genre. However, I would suggest that future customers, particularly English ones, bring their own book just in case they can’t find anything to their taste. Of course Japan is a long way to travel for a book sleepover. Closer to home is Gladstone’s Library, in Hawarden, Wales. This is the UK’s only residential library, offering 26 unique boutique bedrooms. You can read against the backdrop of the idyllic Welsh countryside and roam the cosy village of Hawarden all while only being eight miles from Chester city. The library closes to the general public at 5pm but while staying at Gladstone’s Library you’ll have extended access, 9am – 10am, to almost 150,000 printed items. Best of all, you can take library books back to your bedroom for late night reading. 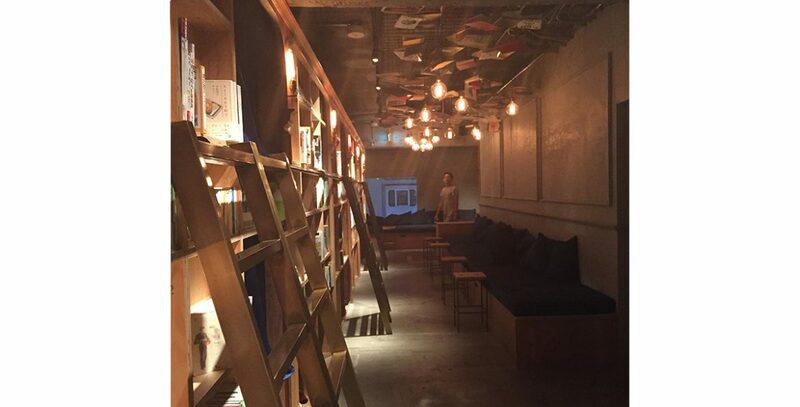 For those who can only escape the world for a few hours, book bars are the perfect retreat. In London there are several of these exciting book hideouts. The Library at Electric House in Notting Hill serves a sybaritic atmosphere with cocktails. Nestled in a cosy wood-panelled space and warmed by an open, crackling fire you can read with drink in hand while vinyl records provide musical accompaniment. Swans Bar at Maison Assouline in Piccadilly is another elegant book bar offering artisanal teas, wine, champagne and cocktails. Maison Assouline is all about luxury culture and their stylish bookshop is the perfect place to enjoy the finer things in life. However, for those of you who do happen to find themselves in Japan The Book and Bed is not to be missed. This Tokyo hostel is a quiet but friendly haven for readers in the middle of one of the busiest cities in the world, but they also have branches in Kyoto and Fukuoka. These hostels offer similar features, the bookshelf beds, bookish décor and cosy reading spaces. However, each branch has a unique atmosphere. The Kyoto hostel provides a traditional Japanese backdrop with beautiful views of Japan’s cultural capital. The location affords some beds a view of the Kamogawa river and access to key tourist spots. In contrast, the Fukuoka hostel has a much more modern atmosphere. The bookshelf beds have a darker, sleeker look. There is also an impressive wall of magazines. With branches in these three popular locations there is plenty of opportunity for tourists and residents alike to visit The Book and Bed. Reading offers the chance to slip into an entirely different world, to explore new ideas and just relax. These book havens have cultivated the ideal habitat for bibliophiles with unique décor and cosy reading atmospheres. They feel like places out of time and are the perfect opportunity to get so lost in the world of books you might never want to be found.